There's no such thing as bad weather! Helping children learn through play since 2014. 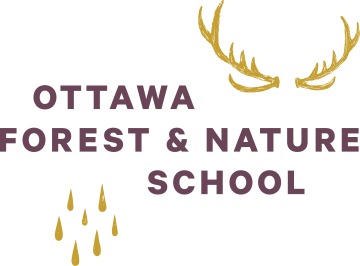 Established in 2014, the Ottawa Forest and Nature School is situated on 900 acres of National Capital Commission land in Ottawa’s Greenbelt on which our growing team of educators provide community-based and school-based programs. It also serves as a demonstration site to highlight innovative practices in Forest and Nature School, catalyzing the movement further with tangible stories about the power of play-based learning in nature. 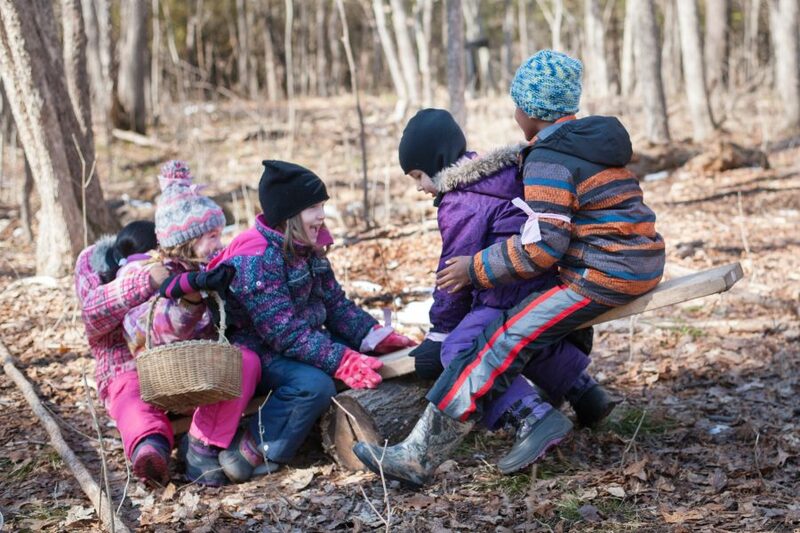 Every day at Forest School unfolds differently based on the community present, their interests, the season, the weather, and the various loose parts found or introduced at the site. 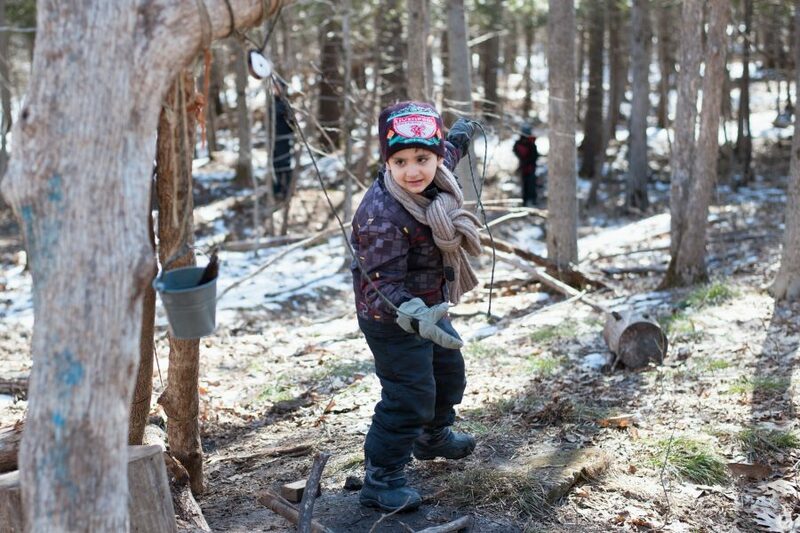 While every day is different, play, exploration, and connection to each other and the land is paramount in all our adventures at Ottawa Forest and Nature School. It could mean setting up a pulley and basket system, or flipping over logs and stumps to search for hiding creatures, or creating a leaf rubbing with the art supplies set up on a picnic table. Once everyone has settled in, participants will be called together for a meeting, during which we check in with each other and make a plan for the day. 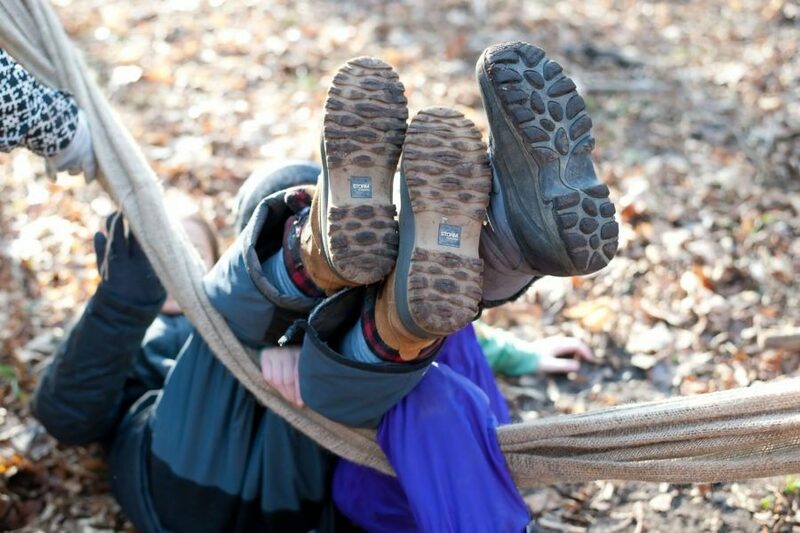 Often that plan involves hiking through the woods surrounding our cabin where we may discover new places to play, build forts, and climb trees. 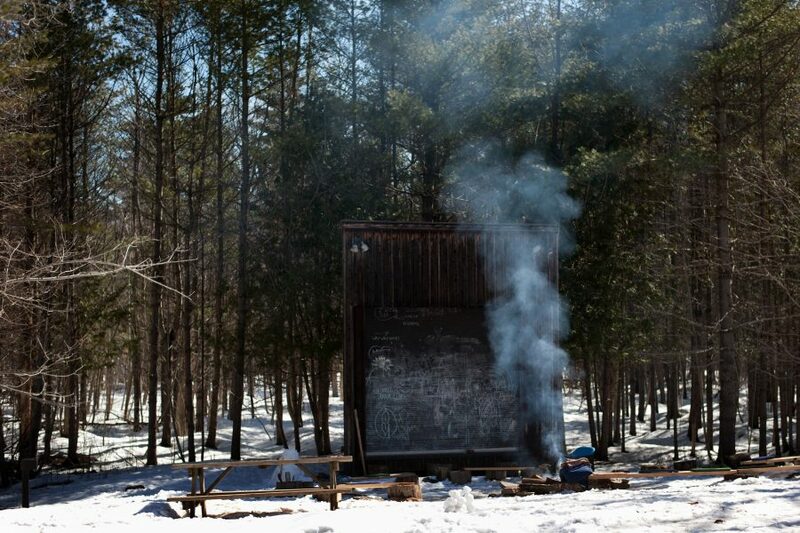 Other times we may stay closer to home, making art, putting on a play, building a fire, or tinkering with tools. As the ending of the day approaches, we gather for a closing to again check in with each other and share highlights and stories from our day, as well as gratitude for the land, her creatures, and each other. Review our Parent Handbook for answers to frequently asked questions and to familiarize yourself with our philosophy, policies, and procedures. Are you an explorer or an artist? We’ve been waiting for you to help us discover the wonders of our site! Are you a cartographer, a local historian, a budding naturalist? We need your help to chart our paths, record our adventures, and unlock the secrets of the rocks and trees and the creatures who live among them. Just follow the sound of the howling wolf, we’ll be waiting for you! Registration: All of our programs are currently full, please complete the waitlist below and we will be in touch with you if a spot becomes available for your child. This program is specially designed to introduce small children to the beauty of the forest. 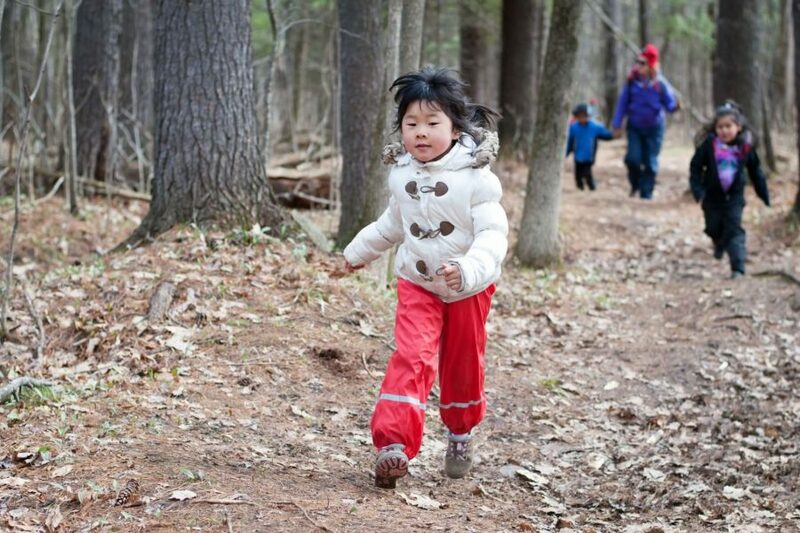 Together we will build coordination and confidence, creativity and resilience by walking trails, scrambling up rocks and balancing on logs, looking closely for evidence of forest creatures imaginary and real, and sharing stories, snacks, affection, and wonder. We can’t wait to begin fostering a lifelong connection to the natural world with your curious and capable children! Registration: Our Half-Day Preschool Programs are currently full. Please complete the waitlist form below and we will be in touch if a spot becomes available for your child. Looking for a fun, stimulating, and creative childcare option for PD Days? Look no further. 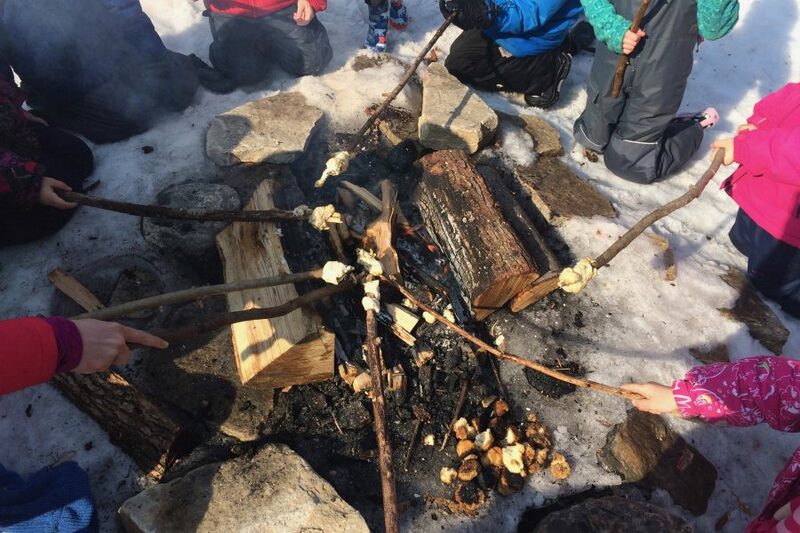 We are offering full day programs on OCDSB PD Days over the course of the year. Register now for one or all available PD Days – that way you don’t have to worry about each one as they come, we can build a closer relationship with your children, and they can build a meaningful relationship with the land. Registration: All of our PD Day Programs are currently full. Please complete the waitlist form below and we will be in touch if you if a spot becomes available for your child(ren). Inviting all parents and caregivers with young children in their lives to get their bodies moving with their little ones! Connect with the outdoors and introduce your child to its gifts in the security of a group. Begin to think about fostering a lifelong relationship between your child and the natural world. We will spend time wandering and playing in the forest, snacking and listening to stories after a beautiful hike. Meet like-minded parents and caregivers, and find support and community as we walk the trails and play before heading back out into the world. This is a drop-in group. Everyone is welcome! No need to pre-register. Little ones get itchy to move once we are on site, so we appreciate your effort to arrive and be ready to wander on time. Session Dates for Winter/Spring 2019: due to holidays and PD days this season, we have outlined our Drip-In program days for the next couple of months. We will be updating this list as we enter into the Spring months. We encourage everyone to check in on our OFNS facebook page prior to coming for any updates on this program. Fees: Sliding scale (Recommended fee: $10/family). 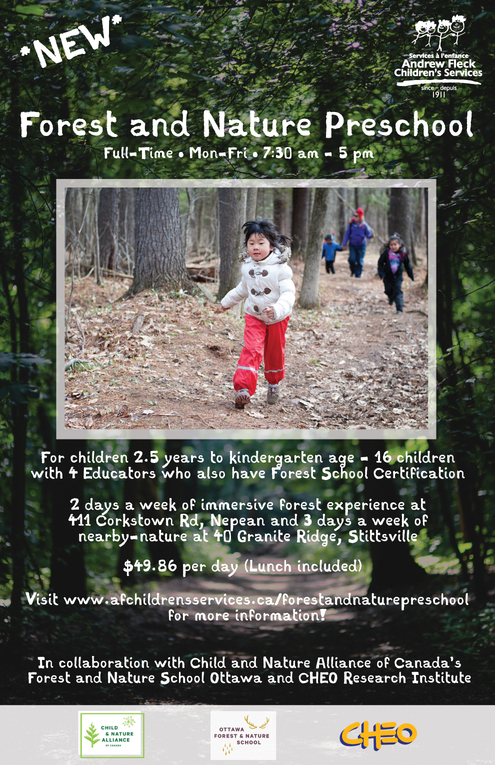 All proceeds from this program will go towards subsidizing our Forest School programs for children and youth. 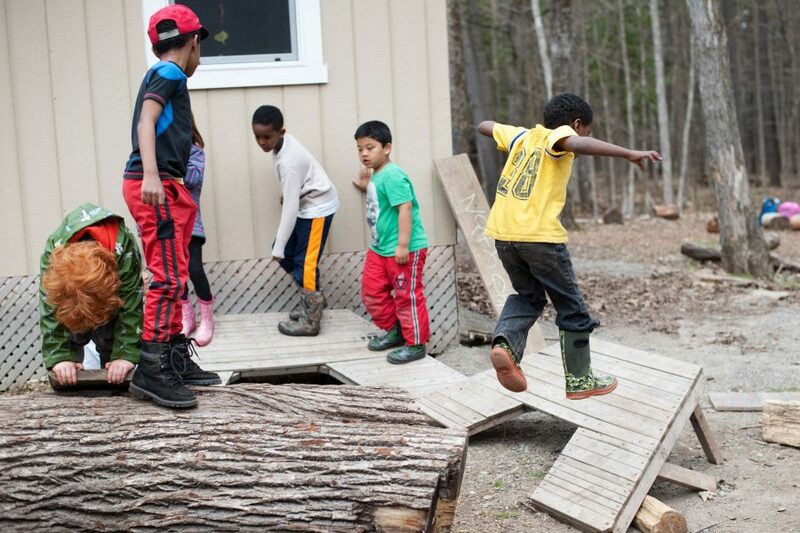 All year round our time in the forest is all about play, and this is especially true for the summer. We start each day with a group gathering, sharing stories and making plans for the day. We then head out for an adventure on the land, exploring the trails, searching for treasure, building forts and soaking in the sunshine. We always take a break indoors in the heat of the afternoon, eating lunch, telling stories, relaxing, before we head back outside to splash in the sprinkler, search for frogs, climb trees, and create clay sculptures. Each week different themes emerge, depending on the weather, what we discover in the forest, and what interests the children. We make music, paint, build structures, splash in puddles, identify birds, watch grasshoppers, fight pirates. Our days follow a rhythm but the specifics vary depending on what nature offers and how the children feel. Our days are full of learning while we play, building connections to the land, each other, and ourselves. Dates: Weekly from July 9th-August 24th, 2018. 9am-4pm each day. *Please note, we do not offer before/after care. Summer Camp registration opens for all families April 16th, 2019 at 12:00 PM (noon). *We realize there was some discrepancy in the timing of registration opening in some of our messaging to families. Please rest assured that registration will be opening at 12:00pm (noon) on April 16th. The Summer Camp REGISTRATION LINK will be share at 9:00am on April 16th by email from CNAC, and posted on the CNAC and OFNS FaceBook Pages. The link will become active for submissions at 12:00pm (noon). Here are some of our most frequently asked questions. If your answer isn’t here feel free to reach out to us! A Day in the Life (above) offers a good idea of our daily rhythm. Each day time is spent in wide, ranging play and in smaller, quieter reflection and story-telling. Children are involved in deciding how to stay safe and how the day will unfold. Educators strive to make space for everyone to do what they need to and want to, as well as bring the right tools along, ask the right questions, and to step back when we are not needed. We never know at the beginning of the day exactly how it will unfold, except that there will be plenty of dirt, rocks, sticks, play, and learning. We often repeat the adage “There is no such thing as bad weather, just bad clothing.” On rainy days we follow a very similar rhythm to sunny days, with the addition of wearing our waterproof layers. Many children believe the forest is much more fun when it is filled with puddles. That’s when it is easier to find frogs and salamanders, too! As mentioned regarding rainy days, we dress for the cold in the winter, and we follow a very similar rhythm to other seasons. We do have a wood-heated cabin on site, though, and each day after exploring and playing in the cold and snow, we cozy up inside to eat, get warm, create, and tell to stories. Are there deer ticks on your site? Interest is so great, we never have enough openings for all of the families interested in sending children to us one day/week. We are grateful and inspired by this interest in Forest School, and we are steadily growing our capacity. We open registration season-by-season, usually in March (for Summer), June (for Autumn) and November (for Winter/Spring). We inform interested families via email. If you would like to be informed when registration is opening, please get in touch with us. What are the educator/child ratios in the forest? 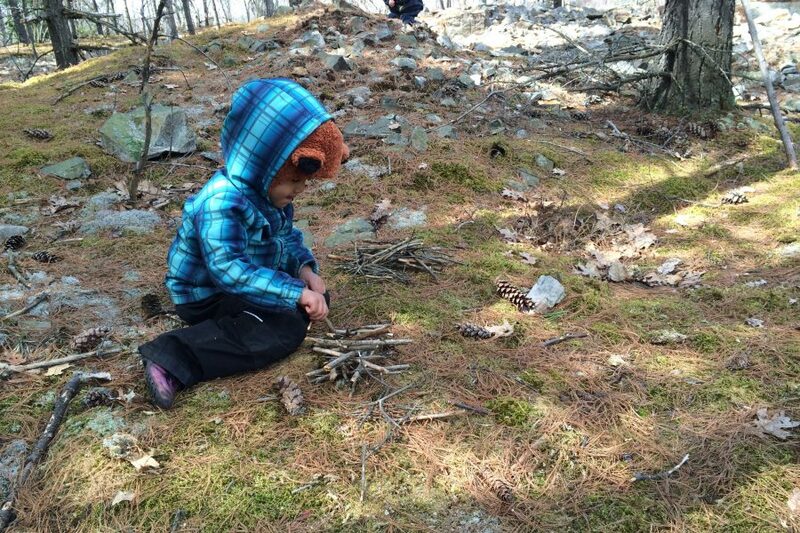 We acknowledge that exploring and playing in the forest is an ever-changing setting and our ratios reflect this. 8/1 is required for our school-aged students, 5/1 for our preschoolers. With guests, practicum placements, and volunteers regularly joining our trained staff, our ratio is often even lower. If you are interested in volunteering we would first ask that you read our Forest School Guide. When you are ready please get in touch with us. We would then set up a date for you to be a guest, ask questions, spend a day experiencing our approach with children in the forest. If you are able to join us regularly, we require a Vulnerable Sector Criminal Reference Check, which we would support you in getting. We would then consult our schedules to make arrangements for you to come play with us when you can. Our volunteers add great enthusiasm, inspiration, and support to our programs. If you are interested, we would love to hear from you! While we have programs running each day of the week, some days are better than others for visiting. 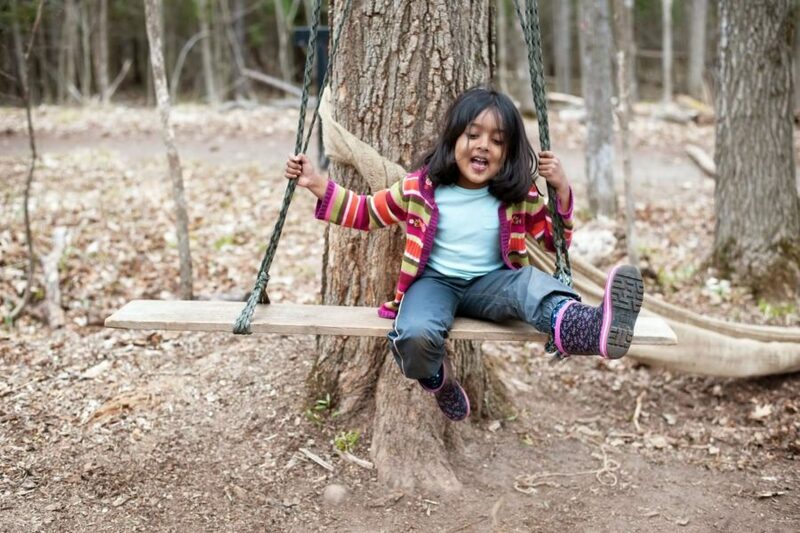 Our Families in Nature Drop-In Program which runs on Friday mornings, are a great time to stop by, get a feel for how children interact with the forest, and to speak to adult family-members about why they value the role forest school plays for themselves and the children in their care. Please see our Families in Nature Drop-In section above for further details. We do not offer once-only field trips. We do work with public school students each week (in nearby-nature and on our site) through our partnership with the OCDSB. 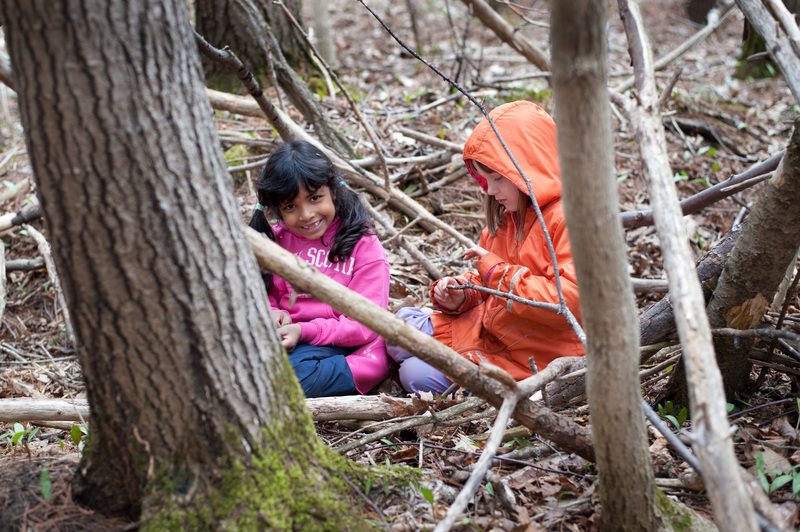 Each class comes to us one day/week for 6 consecutive weeks so that we can all sink into the forest together, and nurture the students’ connections to the land, themselves, and each other. The forest is a lovely choice of venue for celebrating a birthday. We are unable to offer this service now, though we may do so in the future. We understand that there is a need and interest in having before and after school care provided in the forest. We are unable to offer this service now, though we hope to do so in the future. Can I rent your space for my own small event? Unfortunately not. Our space is shared and we cannot accommodate such requests at this time. How many days per week can my child attend your program? In general, children attend our programs one day per week.